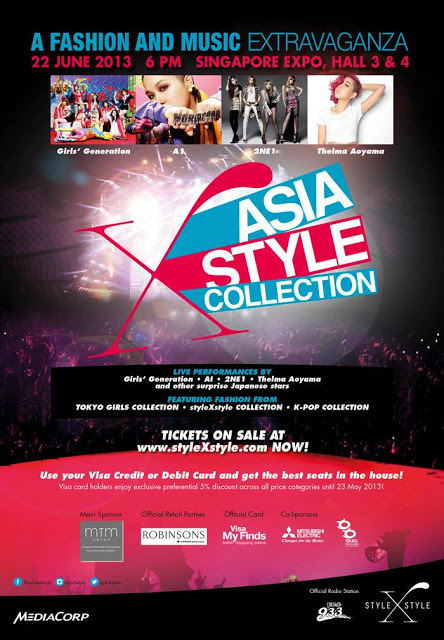 ASIA STYLE COLLECTION 2013 &WIN TICKETS TO ASC! - . ASIA STYLE COLLECTION 2013 &WIN TICKETS TO ASC! YEAHHH! I'm super excited for Asia Style Collection concert that is happening on 22nd JUNE 2013 at Singapore Expo. I will be going with Gushcloud bloggers and will be sitting in a premium bloggers area. Some Gushcloud bloggers will be walking the show with MediaCorp artistes, bloggers and Japanese and Korean stars! (Regretted not going down for the casting as Gushcloud bloggers were called for casting to walk the fashion show. SOB...) Also, Performances by Japanese and Korean stars!! Many exciting lineups for you all. So purchase tickets to this 4-5 hour concert! JOIN styleXstyle contest and WIN A PAIR of TICKETS to ASC (worth $376)! Sign up for an account at styleXstyle.com and post your OOTD there and share the link on Facebook and Twitter! All OOTD posts on styleXstyle.com have to be hashtagged #styleXstyle #Gushcloud in order to qualify for the contest. The user with the most ‘loves’ on their OOTDs will win 1 pair of ASC CAT C Tickets (worth $376).
! !There will be 3 pairs to be given out! !